Apex, NC at 6:30 pm. 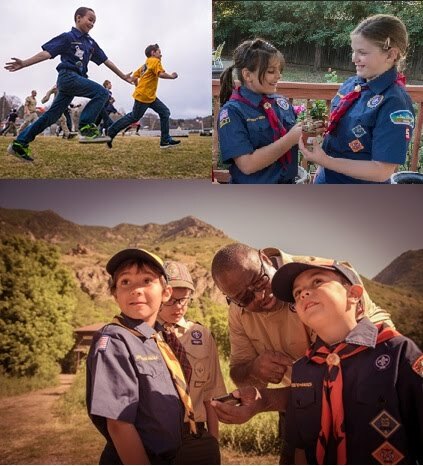 Pack 205 is a Family Scouting Pack that welcomes boys and girls from kindergarten through 5th grade. Email our Cubmaster to find out more! Your Cub is a member of a Den. A Den consists of four to eight Scouts of the same grade level and same gender who meet according to their schedules. A Den Leader (usually a parent) is in charge of the activities, which include games, crafts, songs, advancement, and lots of fun. Your Cub is a member of a Pack. A Pack consists of several Dens and meets at least once a month. The Cubmaster leads Pack meetings, with Scouts and their families in attendance. The Pack meeting is made up of fun activities, as well as the presentation of awards that have been earned during the month. Cub Scouting’s strength is that it is a well-rounded program positively affecting every area of a child’s life. Cub Scouting encourages Scouts to achieve a deeper appreciation of others, including peers, parents, and other adults. Early in their Scouting experience, Cubs learn the value of serving others. Cub Scouting provides Scouts with a sense that they are important as individuals. They learn that their Scouting family cares about what happens to them. Cub Scouting promotes activities that lead to personal responsibility and high self-esteem. As a result, when hard decisions need to be made, a Scout will be proud of him or herself.